We heard you. Based on lots of customer feedback, we’ve recently made a number of improvements on how unavailability works in our rostering software so that our clients can take full advantage of this feature. Now, managers and admins will receive email notifications with all the new or updated unavailability entries from their staff. This means you can keep track of your staff’s schedule and easily click through to see the entire calendar. We recently released a mobile app where your staff can check their roster, enter unavailability (when turned on), and apply for leave. The app makes it much easier than before to enter unavailability, especially when the schedule is a recurring one. If you want to make sure that your employees give you adequate notice before setting their unavailability, you can now set a minimum number of days’ notice in the admin settings. Upon entering their unavailability, your staff will get a warning and won’t be able to input their desired date when it falls within the minimum number of days that you set. This is a new feature that ensures you won’t miss any updates and have enough time to roster other staff to fill in empty shifts. You can start taking advantage of these updates by simply setting unavailability to ‘on’ for your employees. To do this, go to your settings and turn on unavailability under ‘My Account’. Next, get your employees to download the Tanda mobile app. And, that’s it! Your employees can now enter their unavailability via a mobile device. With these new features, managers and admins will now be notified of changes in their staff’s schedule, too. If you have any questions about turning on unavailability for your staff, visit our Help Centre. You can also send an email to employees@tanda.co and we’d be happy to help. A common pain point for managers occurs when staff submit unavailability after the roster has been completed and published. Having to go back to the roster, make changes and re-publish it can be annoying and confusing to staff. To help prevent this situation we’ve always had minimum days’ notice setting for unavailability: This setting works okay, however it doesn’t factor in if the roster has been published further in advance than the minimum number of days notice. Let’s say you have a minimum notice period of 14 days but you have published rosters 3 weeks out (21 days) then you wouldn’t want staff to submit unavailability as this would require the manager to go back and change the roster or tell staff that it won’t be accepted. Both of which take time. Instead, you would want them to request a shift cover. For this reason, we’ve improved the way the unavailability notice works, so that it also factors in roster publishing. 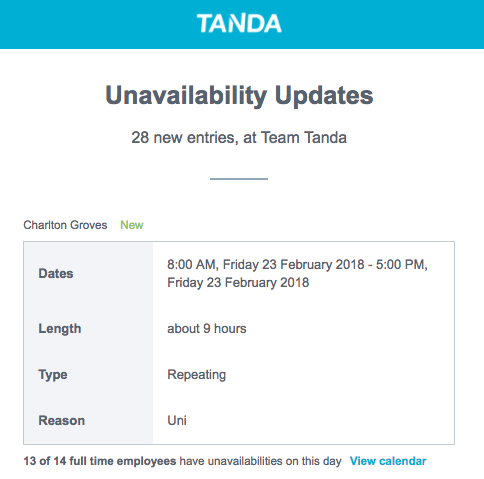 How it works When an employee goes to submit unavailability, Tanda will check whether their roster has been published yet for that date. If it has, they won’t be able to submit unavailability until the day after that roster ends. The main thing to note here is that if the minimum days’ notice is greater than the last day of published rosters, this setting will be used instead. The reason for this is that we know many businesses have a policy around days notice (i.e you must give at least 14 days notice), which we felt was important to still respect regardless of the roster publishing. This is what an employee would see in their app if they went to apply for unavailability within the lockout: This update should reduce the number of manual changes a manager has to make after they publish their roster. This should also encourage staff to get their unavailability entered earlier which is also going to make rostering in advance easier for managers. The great news is if a manager does publish their roster and staff are no longer unavailable they can request a cover and a manager can easy approve the change without ever needing to go back and edit the roster.